The Faculty of Veterinary Medicine and Animal Science (FVMAS) of the University of Peradeniya is the only higher education institution in Sri Lanka that offers an undergraduate study programme leading to the Bachelor of Veterinary Science (BVSc) degree. The current programme extends over eight semesters (four years) and the annual intake is fixed as 80 students per year. Almost all the BVSc graduates find employment as soon as they graduate, primarily in the state sector while increasing numbers are venturing into the private sector and overseas employment. The veterinary profession plays a pivotal role in the provision of healthcare to a companion, farm, aquatic and wild animals, the control of zoonotic diseases, and ensuring the safety of food of animal origin (livestock, poultry and aquatic) locally and internationally. Similar to the medical healthcare profession, the veterinary healthcare profession too has to be modernised and expanded. The scope of undergraduate training must be geared to meet the conventional and emerging needs of the developing and advancing economy of the country. The quality and standards of veterinary education worldwide come under the purview of the World Organization for Animal Health (OIE, Office International des Epizooties), which is an intergovernmental organisation with the mandate of 180 member countries. The key mandate of the OIE is to improve the health and welfare of animals worldwide. It is also the international reference organisation for setting animal health and welfare standards within the framework of the World Trade Organization Sanitary and Phytosanitary Agreement to safeguard trading of animals and animal products, ensure food safety and to optimise animal welfare. The OIE has recently reviewed the performance of veterinary services of Sri Lanka and made recommendations for far-reaching changes in veterinary services including recommendations pertaining to veterinary education. The FVMAS of the University of Peradeniya has responded to the concerns expressed by both the OIE and Sri Lankan stakeholders, and recently completed a comprehensive revision of its veterinary undergraduate curriculum under the auspices of a formal OIE intervention in which the University of Peradeniya was ‘twinned’ with the Massey University of New Zealand. This was the world’s second ‘twinning programme’ to improve the quality and standards of veterinary education in a developing country with the direct partnership of a developed country. The first ‘twinning programme’ was between the Chiangmai University, Thailand and the University of Minnesota, USA. As a prelude to the curriculum reforms, academic staff from Massey University and FVMAS conducted a critical review of the current veterinary degree programme. 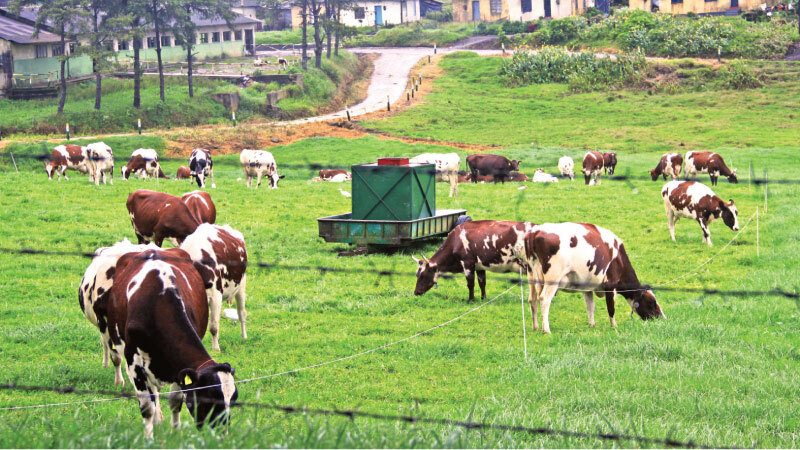 Based upon the findings of the review, the new curriculum was designed by restructuring and revising the existing veterinary undergraduate programme to produce veterinarians who would be able to serve the needs of Sri Lankan and international stakeholders better, with respect to animal health, production, welfare and veterinary public health. The veterinary undergraduate degree programme based on the new curriculum will provide sufficient depth and breadth of material on animal diseases and their management, biosecurity, animal husbandry and production etc., to meet the demands of entry-level clinical competence at the point of graduation. To deliver the new curriculum, FVMAS has adequate teaching facilities and well-qualified teaching staff where nearly all have doctoral degrees in their discipline of teaching. The University Grants Commission has recently granted the approval for the new curriculum that will enhance the depth and breadth of the BVSc study programme while extending the duration of the programme over five years. In addition, the Veterinary Council of Sri Lanka, the statutory body concerned with the veterinary profession in Sri Lanka has evaluated, reviewed and endorsed the proposed curriculum in its capacity in fulfilling current and immediate future needs of the veterinary profession. 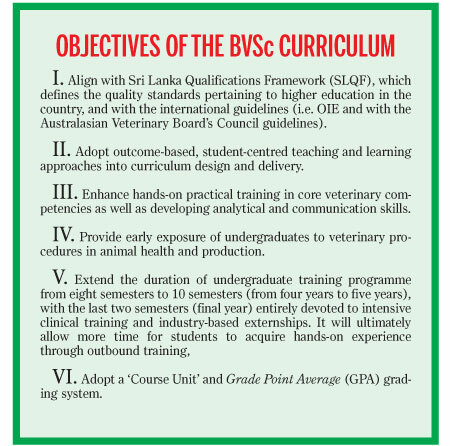 Once the BVSc degree programme obtains the accreditation of Australasian Veterinary Board’s Council, Sri Lankan Veterinary graduates will be able to practise in Australasian countries without having to pass the qualifying examinations. The new curriculum will be formally commenced with the 2019/2020 admission, and this indeed will be a milestone of veterinary education, which would expand the horizon of veterinarians and the veterinary profession in Sri Lanka. (The writer is Chairperson, Curriculum Revision and Implementation Committee and Head, Department of Veterinary Clinical Sciences, Faculty of Veterinary Medicine and Animal Science, University of Peradeniya).